* This post is sponsored by The Home Depot. All opinions remain my own and uninfluenced. Remember way back to last week when I told you guys about the cute wheelbarrow you can learn to build at your local Home Depot this month? The Home Depot offers workshops in each store all ages and experience levels. There are Do-It-Yourself (DIY), Do-It-Herself (DIH) and kids workshops. They are a great way to learn how to build fun projects and become more comfortable with tools and home improvement. To learn more about these workshops, go here. Have you signed up yet!? It may be called a Do-It-Herself workshop, but boys can play along too! 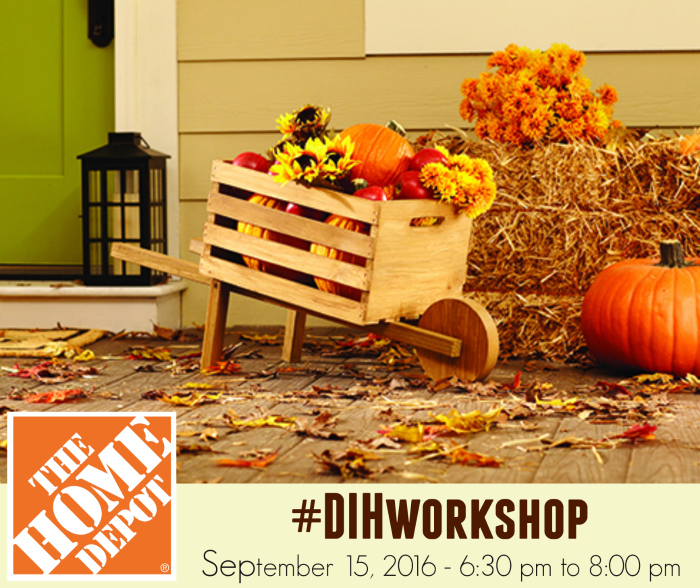 You can follow the link below to attend a free #DIHworkshop in your area. In the meantime, it's time to party! I'm taking part in a virtual party with 25 talented bloggers, each making their own little wheelbarrow (links to all blogs below). 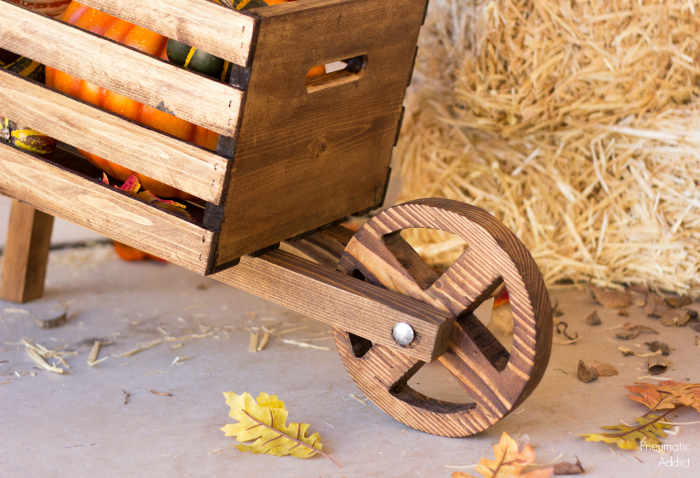 I'm sharing my version of a rustic wood wheelbarrow if you're a little rebellious and want to try something different. (2) 2 x 2 @ 36"
(1) 1 x 10 @ 9-1/4"
1. 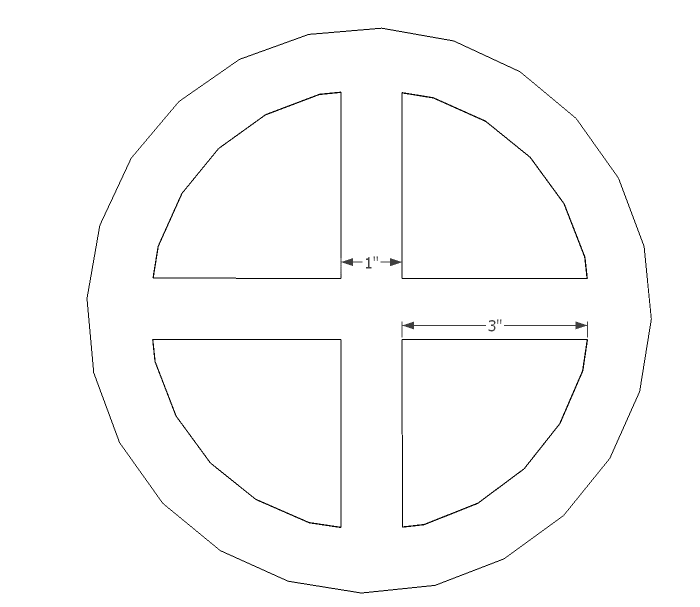 Use the image below as a template to create a wheel from the cut piece of 1 x 10. You'll need to expand the image so the wheel is 9-1/4" in diameter. Since its larger than a standard size of paper, you'll need to cut two and tape them together. Use a ruler to make sure the dimensions on the template are what they state. 2. 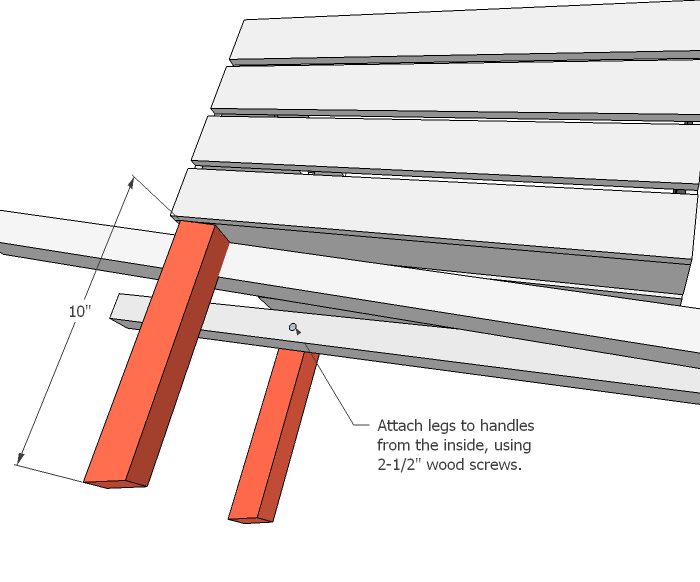 Drill a hole 1-1/5" from the end of each 36" rail, at a 5 degree angle, sloping in. 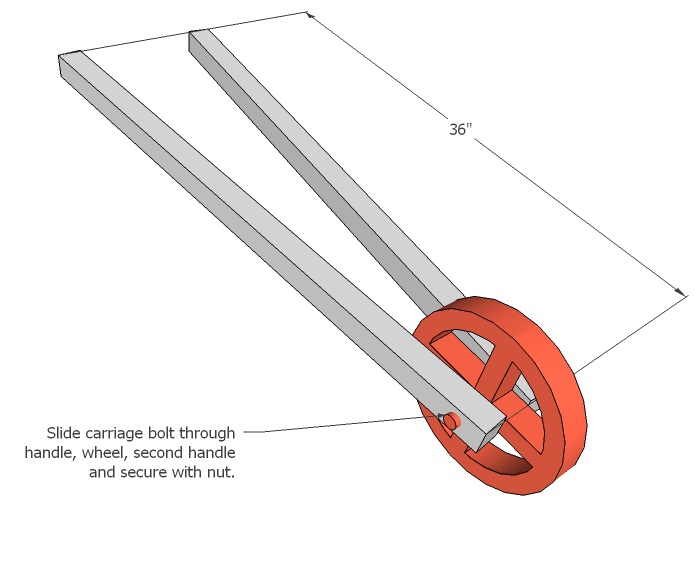 Slide a 5-1/2" carriage bolt through one rail, through the center of the wheel, and out the other rail. 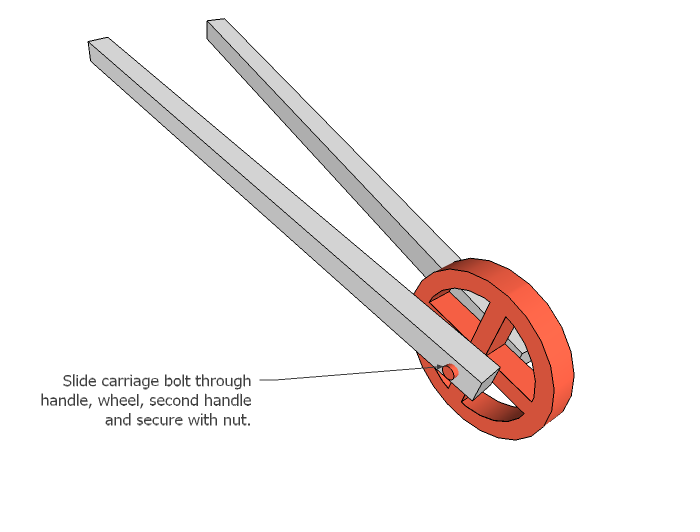 Make sure the rails are level with each other and secure the bolt with a 3/8" dome nut. 3. Measure 7-1/2" from the wheel end of the rails and align your crate. 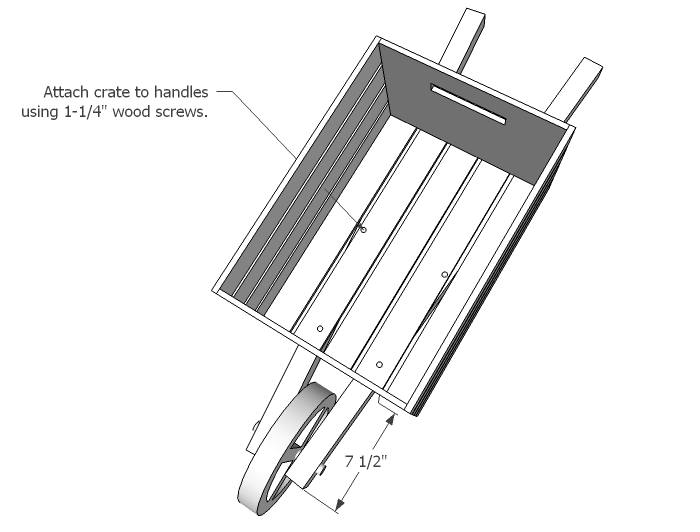 Pre-drill and attach the crate to the rails using 1-1/4" wood screws. 4. Just under the back end of the crate, place the two legs with the angled end down. Drive 2" wood screws through the inside of each rail, holding the legs in place. 5. 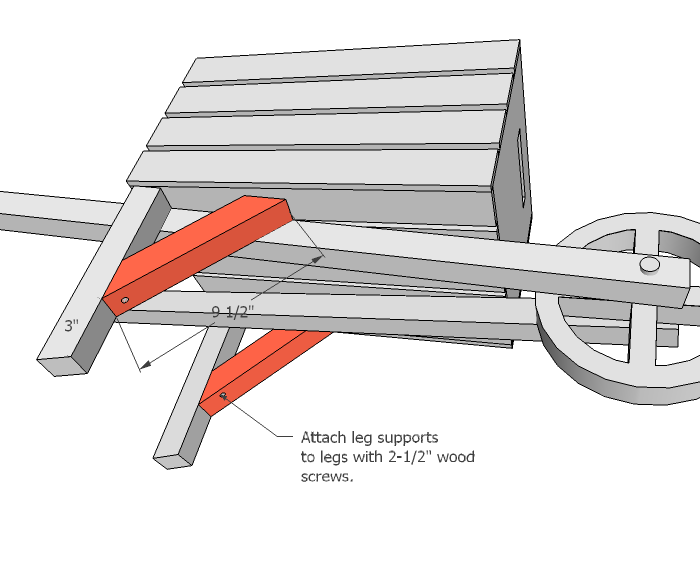 Place the angle supports between the legs and the crate. 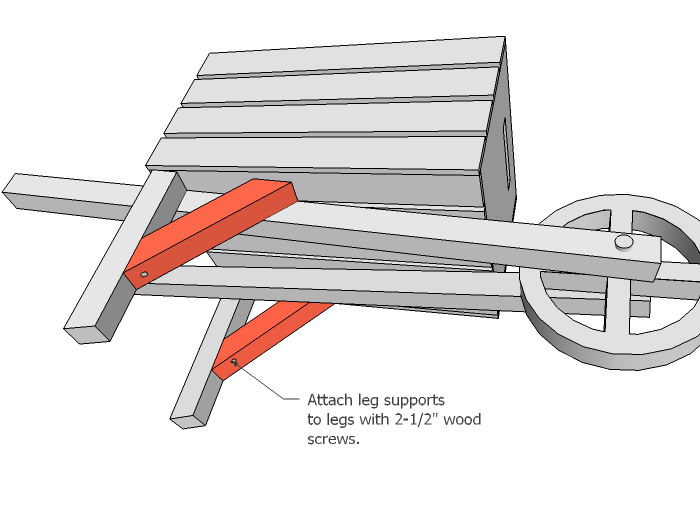 Drive a 2" wood screw horizontally through the support and into the leg. 6. 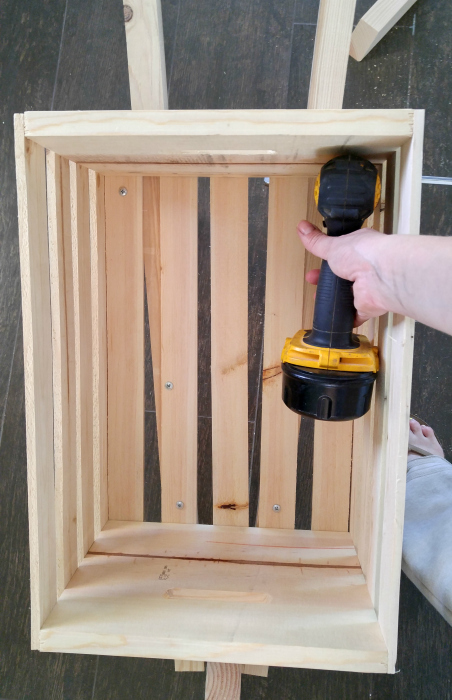 From the inside of the crate, pre-drill and drive 1-1/4" screws through the crate and into the top of the legs and leg supports. That's it! 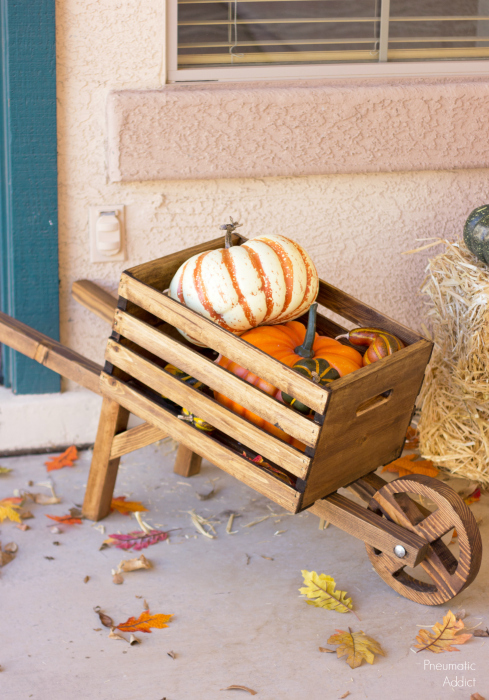 You can add stain or paint to your cute little wheelbarrow to jazz it up, or leave the raw wood. I really think the spoked wheel makes it look more authentic. What do you think? 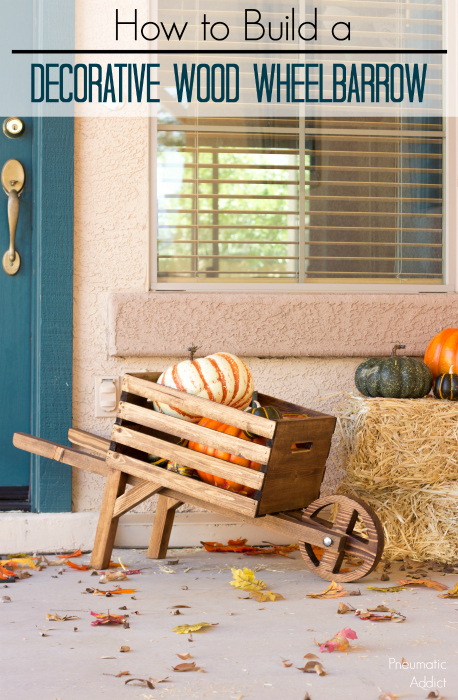 Just fill it up with pumpkins and you're ready for fall! The wheelbarrow is pretty sturdy. I used faux pumpkins. but it could handle a couple of the real ones. I want to thank my friend Brad from Fix This Build That for inviting me to the party! 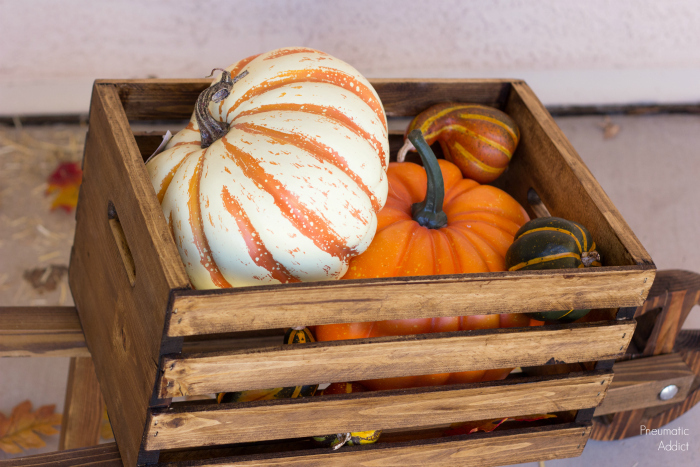 There are 25 other creative bloggers sharing their version of this fun fall project. Make sure to check them out and share the love. 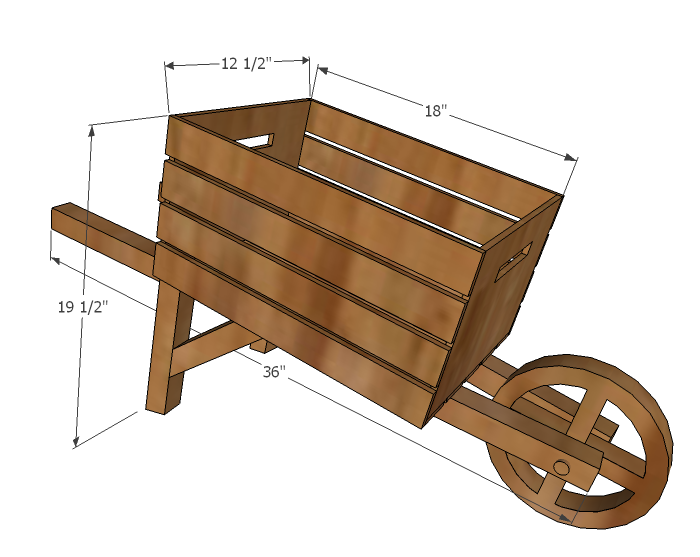 Are you ready to attend the next Do-It-Herself workshop and build your own rustic wheelbarrow? You can register here. You front porch wants you too. Make sure to share your masterpiece on social media and use the hashtag #DIHWorkshop so I can see your hard work! Very cute! 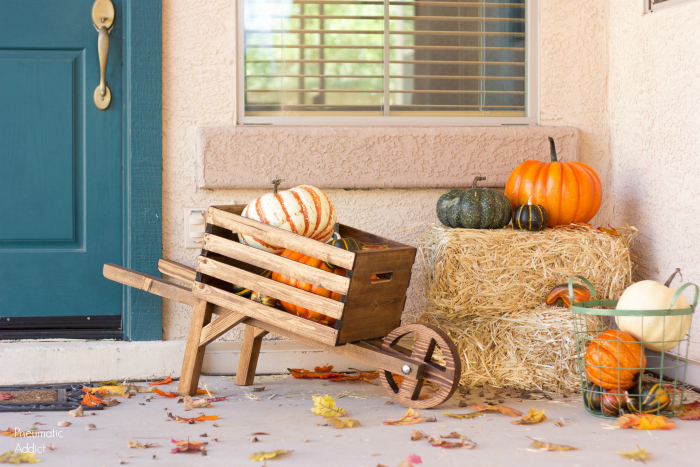 Perfect for your porch for fall. It is such a cute and easy project! I love how it looks in your porch, that wheel is perfection! That wheel is such a cute and easy update to this project - love it! I have to admit the you are my favorite! This wheelbarrow looks useful for home.